Free shipping. Buy direct from HP. See customer reviews and comparisons for the Linksys RE6700 IEEE 802.11ac 1.17 Gbit/s Wireless Range Extender. Upgrades and savings on select products. 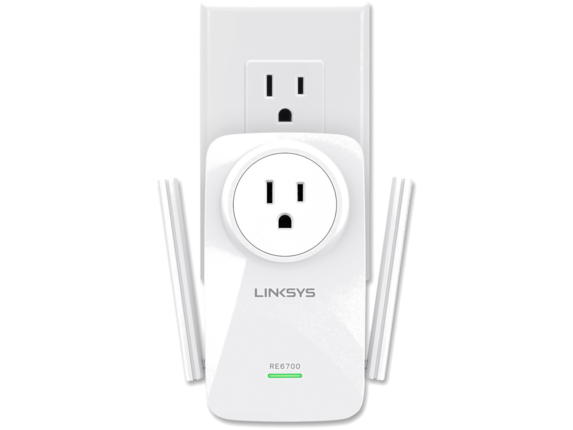 Dual-band, Wi-Fi range extender helps eliminate dead zones and extends the existing range of your current network up to 10,000 square feet. Integrated power outlet lets you maintain use of the power outlet even when it's plugged in. Cross-band technology maximizes the simultaneous use of both bands for high-speed data transfer and uninterrupted streaming. Simultaneous dual-band delivers a stronger connection at speeds up to AC1200. Beamforming technology focuses the Wi-Fi signal directly to your devices instead of sending out a general transmission to help eliminate dead spots. Spot-finder technology directs you on finding the right placement for this extender to make sure you're getting the best possible Wi-Fi signal. Audio capability lets you connection to a stereo system or audio speaker and stream music from a mobile device or computer. Universal design works with any wireless router (sold separately) for simple operation.